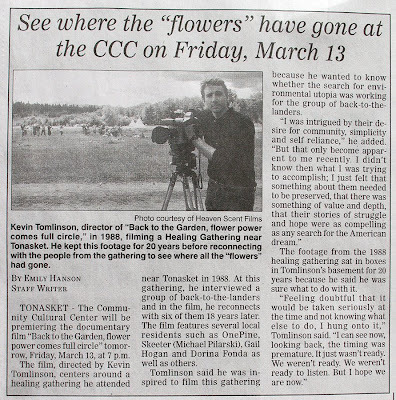 back to the garden... flower power comes full circle: Big Weekend screenings in the Okanogan. Big Weekend screenings in the Okanogan. to support "Back to the Garden, flower power comes full circle". Special thanks to Don at KTRT 97.5 fm in the beautiful Methow valley, Joyce Campbell and Sue Misao at the Methow Valley News, Aaron Studen at the Twisp River Pub for all their help in getting folks to come see what turned out to be a very special screening. It was packed!!! 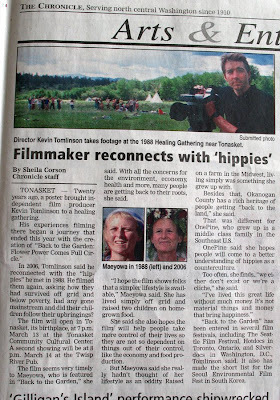 Thanks also go to Emily Hanson at the Okanogan Gazette and Sheila Corson of the Omak Chronicle for writing fab stories that helped spark local interest in of our 2o year film project. In Tonasket, thanks to River Jones, Peter James, Julie Greenwood, Alice and all the great folks at the Tonasket Community Cultural Center and the Tonasket Co-op, where it all began!